Naming your group after yourself usually means one of three things: a) You're a jazz musician, b) You're the guitarist in a rock band who wants to be a jazz musician, or c) You're a rampant egoist. But Sian Alice Ahern, leader of the London, UK-based Sian Alice Group, is none of these things-- as a frontwoman, she's as likely to recede as take the lead. With her band's debut charting transformations from psychedelic rock, pastoral folk, and piano-lounge balladry into analog-synthtronica, free-jazz breakdowns, pounding Afro-tech grooves, and avant-classical composition, Ahern is the sort of vocalist who patiently waits for the songs to settle into shape before stepping up to the mic. In their open-ended, exploratory approach to songwriting, Sian Alice Group-- co-founded with Rupert Clervaux and Ben Crook-- are logical additions to the Social Registry stable. But they'd be even more at home on the early 1990s Too Pure roster, which seemed to produce an inordinate amount of female-fronted bands (Stereolab, Laika, Th' Faith Healers, Pram) who severed psych from its 60s-rock roots and applied its principles to non-rock musical forms, emphasizing the music's hypnotic, repetitive qualities-- and, more often than not, sublimating their singers into a textural detail. Ahern spends 59.59 vacillating between presence and absence. But her turns in the spotlight contribute a considerable amount of heat to an album mostly set on simmer, no more so than on the sinister swamp blues of second song "Way Down to Heaven": "I'm on my way to heaven now," Ahern declares, but the dirty PJ Harvey riff sounds like it's pulling her down in the other direction before setting the song alight in a blaze of distortion and ear-piercing organ tones. "Contours" is another early standout, with Ahern's choral vocal leading the hazy, synth-swathed hymnal before the drums come crashing in and start hunting for Caribou. 59.59 could use a few more fiery moments like these; as the album settles into its more temperate second half-- marked by sullen, straight-forward piano lullabies like "Murder" and "Heartless"-- the titular album length seems less a product of fortuitous circumstance than a premeditated goal, with the tracklist deliberately padded to arrive at the numerically neat running time. 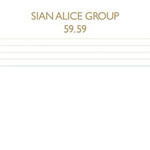 But the beauty of Sian Alice Group is that formalism is ultimately a temporary condition, and that the band is capable of creating highly effective music even when they stray far from traditional torch-song territory: "Days of Grace III" is built on a striking, repeated piano motif that accrues an almost "Tubular Bells"-like tension, while the closing, free-floating instrumental "Complete Affection" (featuring Spiritualized/Spring Heel Jack member John Coxon on guitar and Gang Gang Dance's Brian DeGraw on piano) is messy, pained and cathartic-- like all good crying fits should be.